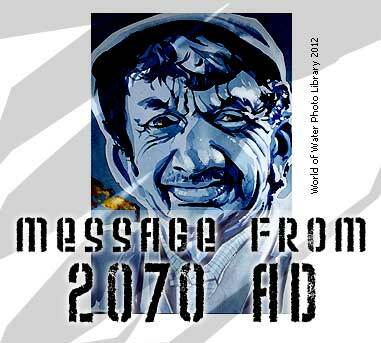 Is this a message from the year 2070 AD ? LETTER WRITTEN IN THE YEAR 2070.
but I look and feel 85. I suffer from serious kidney problems, because I do not drink enough water. I’m afraid I do not have much time left to live. I am one of the oldest people in this society. I remember when I was a child of 5.
and I could enjoy having a shower for half an hour. Nowadays we use towels with mineral oil to clean our skin. Before, women had beautiful hair. Now, we have to shave our heads to keep them clean without the use of water. coming out of a hosepipe. Now, my son does not believe that water could be wasted that way. and TV, but nobody paid attention. We thought that water was to last forever. are either dry or contaminated. Industry came to a standstill, unemployment is sky high. and workers receive part of their salary in drinkable water. Assaults on the streets for a can of water are very common. Before, it was recommended an adult drinks 8 glasses a day. Nowadays, I am only allowed half a glass. and this increases the amount of litter. We are using septic tanks, because the sewerage system does not work for lack of water. All the people look horrible: wrinkled due to dehydration, full of sores caused by ultra violet radiation, as the ozone layer is almost gone. Skin cancer, gastrointestinal infections and of the urinary tracts are the main causes of death. Due to the excessive drying of the skin young people of 20 look like 40. Scientists have no solution to the problem. Water cannot be produced, oxygen is not sufficient due to the lack of trees and vegetation, and the intellectual capacity of the younger generations is severely impaired. The morphology of spermatozoa in many men has changed. As a consequence, babies are born with deficiencies, mutations and physical deformities. The average life expectancy is 35 years. Water became a very coveted treasure. Any green zones crossed by rivers are guarded by armed soldiers. Where I live, there are no trees, because it seldom rains. If it does, it is acid rain. We were warned to look after the environment, but nobody cared. the beautiful flowers, the rain, how we swam and fish in the rivers and dams, drinking all the water we could, and how healthy people were. Daddy! Why there is no water? My generation destroyed the environment. We did not heed the warning signs. as the destruction of nature has reached an irreversible stage. ……….that we still had time to save our Planet Earth. *All such words need to spread globally. Words must be backed up by actions. The World of Water Charity needs a lot more practical support so if you can help in any way, contact us. Please think of Waterlife and your Water use everyday. No Clean Water – No Life.